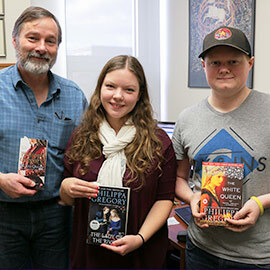 When Emily Dykeman and Scott Milne entered their fourth year as Medieval Studies majors at Laurier, they didn’t envision themselves Skyping with a New York Times best-selling author and historical fiction expert such as Philippa Gregory. But that’s exactly what they did this fall as part of Professor Chris Nighman’s new capstone course, History and Historical Fiction: Philippa Gregory's Wars of the Roses. Gregory, a feminist, writes the “histories” of influential and historically significant women that are under-represented in historical documents. Nighman’s students examined how Gregory created the lives of women such as Elizabeth Woodville (wife of King Edward IV), Margaret Beaufort (mother of Henry VII), and Jaquetta of Luxembourg (mother of Elizabeth Woodville). Dykeman, Milne, and their classmates had the opportunity to discuss those choices with Gregory, and ask questions about her approach to writing historical fiction during their 55-minute question-and-answer Skype session. Aspiring fantasy writers, Dykeman and Milne seized the opportunity to engage with an expert like Gregory. For Nighman, the Skype session provided his students with an opportunity to think critically about Gregory’s content, carefully analyzing how she intersects historical fact and fiction in order to represent this historical period to a contemporary audience. With the resurgence of medievalism in popular culture, there is no shortage of content for Nighman’s students to critique. Laurier’s Medieval Studies program has an exciting repertoire of core courses, with offerings such as Harry Potter and Medieval Culture, Game of Thrones and Medieval Culture, and An Introduction to Medieval Manuscripts.